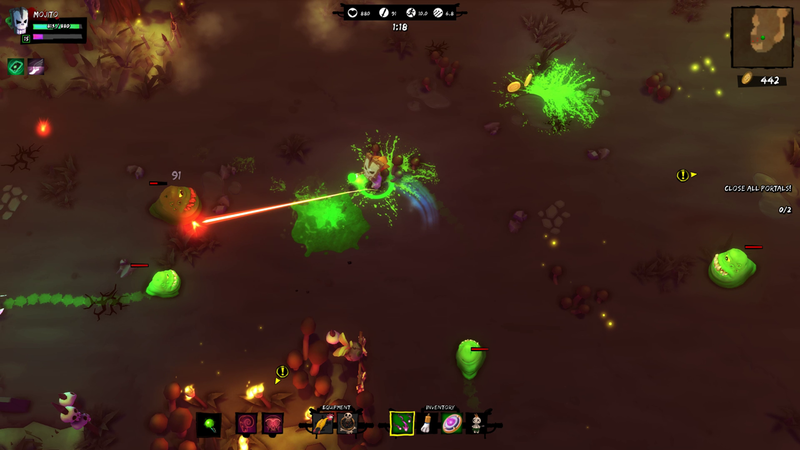 HomePCGAME REVIEW | "Rampage" Quickly Loses Its "Mojo"
Twin-stick shooters and I have a bit of a love-hate relationship. Sometimes they'll bring me flowers and embrace me with warmth & kindness (Enter the Gungeon, Renegade Ops), whereas other times they'll punch me square in the belly and tell me they've been cheating on me with my best friend (Ugly Americans: Apocalypsegeddon, Voltron: Defenders of the Universe). In regards to Full Mojo Rampage -- the latest game from Nicalis (1001 Spikes, Cave Story) -- I'm pretty sure it's reopened their Tinder profile behind my back while it left a half-cooked lasagna out for my dinner. 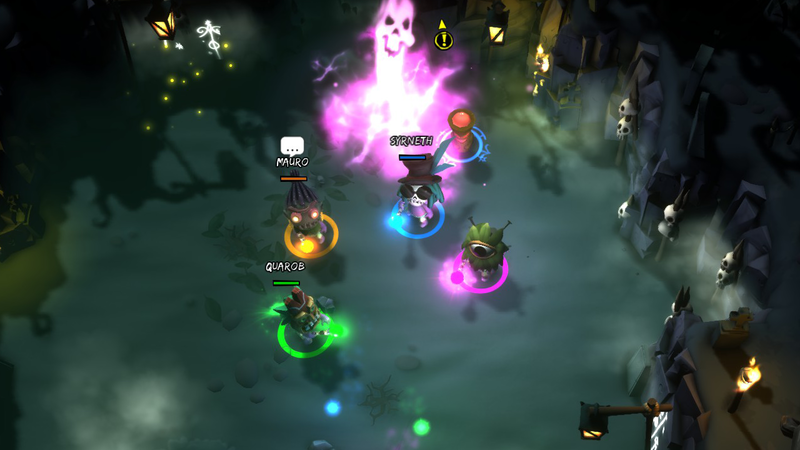 Developed by Over The Top Games (NxyQuest), Full Mojo Rampage has you in the role of a voodoo-like apprentice. Serving deities known as Loa, you are tasked to take out enemies, close portals, and learn all new kinds of tricks of the dark magic trade. As you level up, you'll also be given the chance to upgrade your weapons, become a stronger fighter on the battlefield, and even be able to change your visual appearance via different masks. As the levels are randomly generated, it's practically impossible to create a true strategy to take this game head-on. In most cases, I find that rather exciting, as it means no two gameplay experiences will be alike. You have no idea what lies ahead when you enter a level, and it also means that you'll have to be on your toes at all times as you search along the area for the mission objectives. Sadly, Full Mojo Rampage suffers from a common issue I've found in many twin-stick shooters: repetitive gameplay. Throughout my entire time in a level I found myself using the right-stick from start-to-finish, spinning around willy-nilly as I took on hordes of skeletons, monsters, and other voodoo-inspired creatures. It also doesn't help that the enemy AI is set at either way too easy or ridiculously hard. In quite a few instances, I vanquished a bunch of skeletal enemies while barely taking a hit, only to be killed off by a stronger opponent with just one or two shots. It also doesn't help that this game has quite an unforgivable checkpoint system. Many times I completed half of a game's chapter, when all of a sudden, I accidentally walked into a trap and died. That's when the most frustrating moment happened: I had to start all the way from the game's beginning. While you do keep what you previously earned from your missions, the fact that you have to play through the tediousness this game presents itself throughout its 6-7 hour runtime makes it all the more aggravating. 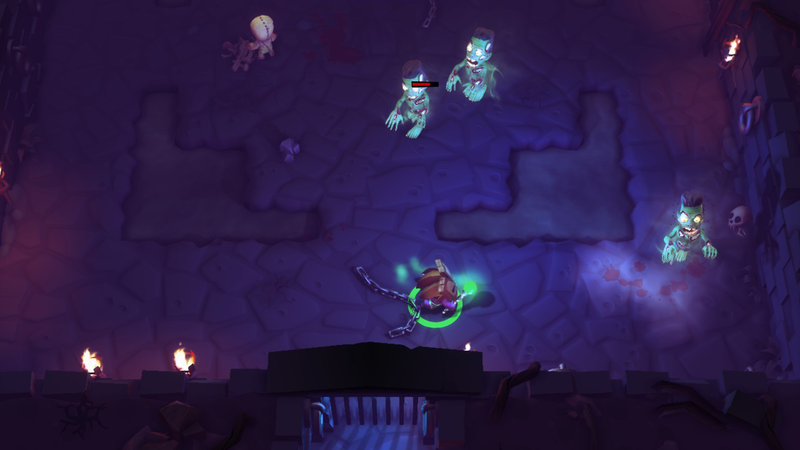 A big shame Full Mojo Rampage plays the way it does, as it is a rather visually-striking game. There's quite a lot of personality pushed into these haunting worlds, and the characters seem rather enjoyable to play as. Hell, I even loved some of the quick humor they placed into the story, especially when it involves the certain vices of some of your higher-ups. However, because of its gameplay, the outer beauty that's featured throughout is bogged down into a forgettable experience. Full Mojo Rampage features a varied of online modes as well, be it your co-op and King of Mojo scenarios or your run-of-the-mill capture-the-flag or Deathmatch modes. These modes showed a lot of promise in the trailers and screenshots I bore witness to, hopefully giving another life to a game whose single-player mode disappointed me. Unfortunately, every time I went online, there wasn't one gamer in any mode I could give these modes a whirl on. If that isn't a bad sign for a game that's only been out for a month, then I don't know what is. Full Mojo Rampage had potential, and from a respectable publisher like Nicalis, I expected far more. Unfortunately, the repetition and terrible checkpoints make this spooky adventure unworthy to check out, even for an entire box of Scooby Snacks. Sorry, Full Mojo Rampage, but I'll have to end our time together here. It's not you, it's...okay, it's definitely you.